The two met in 1995 when Larson was a volunteer nurse at Christ House in Washington, D.C., a medical respite center for the homeless. James was a patient there, tall, quiet and always carrying around a large duffel bag stuffed with sheet music. At lunchtime, he’d sit down at the center’s piano and make it come alive with exquisite music, Larson told Northwest Catholic, the news magazine of the Archdiocese of Seattle. The Professor, the story went, had once been an instructor at a prestigious college before a life event left him homeless. “I think his photograph is out with all of our family photos because he will forever be special in my life,” Larson said. The Professor eventually became one of Larson’s first portrait painting subjects. Larson has become known in the Seattle area and beyond for creating vivid portraits of her patients at Harborview Medical Center’s Pioneer Square Clinic. 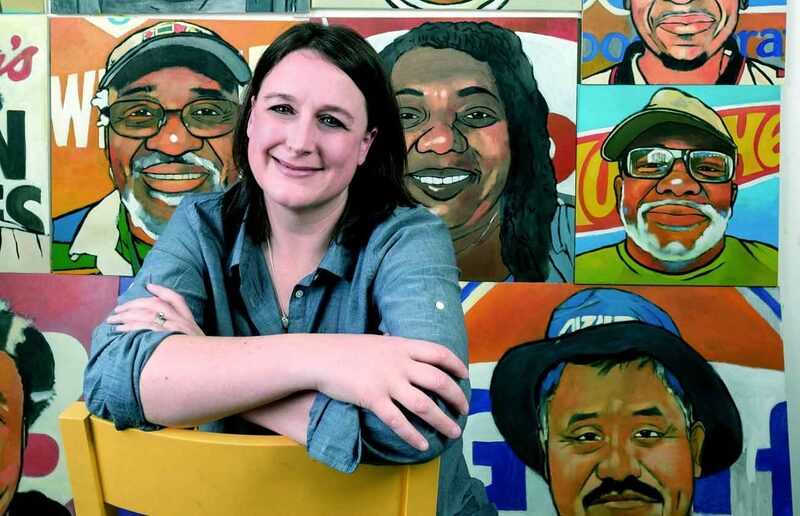 All of her portrait subjects have been touched by homelessness, said Larson, the clinic’s assistant nurse manager. Larson grew up in an active Catholic family with a service mentality. Her uncle, Father Jan Larson, is a senior priest for the Archdiocese of Seattle. Her parents were involved at Our Lady of the Lake Parish in North Seattle, and she attended the parish school before going to nearby Bishop Blanchet High School. Her Catholic upbringing taught her to incorporate Gospel values into everyday life, she said. A particularly influential experience for her was when Bishop Blanchet’s campus ministry program made cheese sandwiches and took them to the St. Martin de Porres Shelter, which serves homeless men 50 and older. “That was one of my first big experiences with homelessness and probably one of the most important in determining my trajectory,” she said. While Larson was in high school, her family started attending Seattle’s St. James Cathedral, where they got to know Archbishop Raymond G. Hunthausen, who headed the Seattle Archdiocese from 1975 to 1991. Larson said the archbishop and his focus on service, is one of her inspirations. Larson’s portrait of the archbishop hangs in Cathedral Hall today. Archbishop Hunthausen encouraged Larson to attend his alma mater, Carroll College in Helena, Montana, where she earned a nursing degree and decided to focus on working with the poor and homeless. But Larson also has been artistic since she was young, doing illustrations, cartoons and eventually photography. In college, she would call home and debate her career path with her parents, who told her that she would figure out how to blend her art with nursing. Larson eventually did a volunteer year at Christ House in the District of Columbia, where she used her family’s graduation gift of a camera to take photographs of homeless people, like The Professor. After moving back to Seattle in 1996, she started nursing work at the Pioneer Square Clinic and various shelter sites. On a rainy day in Seattle several years after college, Larson passed an art supply store, went in and bought some paints to try out. The first paintings she did were portraits based on the photos of homeless people she’d taken in the nation’s capital. Then some of the patients asked her to paint them. She has since completed more than 300 such portraits. When Larson was getting ready to hang her first series of portraits at a Starbucks in Seattle, it didn’t feel right to list them for sale for money. At the same time, the Pioneer Square Clinic needed new socks for its clients. So, Larson listed the portrait prices as several hundred pairs of socks. They quickly sold and she has maintained this charitable bartering system for her work ever since. Paintings have sold for hundreds of cans of food, sandwiches, gloves, hats and other items needed at the clinic, area shelters, food banks and charities. Larson asks each of her subjects to tell her one thing they want people to know about them and bases the painting’s backdrop on that detail. She often works on a series of portraits all at once. The work goes in stops and starts around her full-time nursing job and life with her husband, Joe Mahar, and their 9-year-old son, Paddy. Larson said she wants people to smile when they look at her work. Each subject should invite you in. Take Felton, a regular client and a former boxer. He casually grins at the viewer in front of a Wheaties logo, like the cereal box on which Muhammad Ali once appeared. “He has the patience of a saint, he’s been waiting so long for me to finish,” Larson said of Felton’s portrait. Weaver is multimedia editor at Northwest Catholic, the news magazine and website of the Archdiocese of Seattle.